The tools and technologies surrounding community colleges have changed immensely over the past 50 years, but this school’s dedication to a quality higher education remains steadfast. Look back at MCC’s past and how it has maintained its promise to area students. The mix of students attending MCC is skewing younger, says sociology professor Mark Eckel, and more students are attending classes during the evening. When McHenry County College opened its doors in 1967, the first handheld calculator had just been invented, the cost of a Super Bowl ad was $42,000 and Lyndon B. Johnson was in the White House. Plenty has changed over the past five decades, including in the education world, but one thing that hasn’t changed is McHenry County College’s dedication to providing a quality higher education for area residents. As this Crystal Lake-based community college reflects on its past, it’s also setting the foundations for an exciting future. In 1965, the Illinois General Assembly passed the Illinois Junior College Act, which enabled voters to establish community colleges to serve their regions. Soon after, a dedicated group in McHenry County sought to bring a college to their area. In April 1967, voters approved the referendum establishing McHenry County College. Not everyone welcomed the results. MCC’s five-member board of trustees met for the first time in June 1967, and in November, they selected their founding president: Forest D. Etheredge, then serving as vice president of Rock Valley College, the community college in Rockford. The new school still had yet to be named, so a community contest was held; the winner would receive a $100 scholarship. The winning name? McHenry County College. An interim campus was established in 1968 at the former Pure Oil research laboratory, a facility located on Northwest Highway in Crystal Lake, where a Jewel-Osco now sits. The first MCC catalog wasn’t so dissimilar from what it is today. Fields of study included accounting, business mid-management, electronics technology and business data processing technology. The college’s first graduation took place in 1970, with 42 students crossing the stage. Those first years in the Pure Oil building were an ever-present reminder of the need for a new, fresh campus that was more conducive to learning. The building was notorious for being damp, with water constantly dripping from the ceilings and condensation gathering in the summer months. Mark Eckel, a current MCC faculty member who’s taught sociology for 35 years, has heard the stories. In February 1972, voters approved a $3.1 million bond referendum for a new building on U.S. Route 14, in the northwest portion of Crystal Lake. In May 1975, the Pure Oil building was vacated and college operations were moved to the new campus. MCC continued to grow over the next few decades. In the 1980s, the board approved a business and industry employee training facility, which eventually became the Shah Center, a facility for business training services, including one-on-one counseling for entrepreneurs and on-site employee training seminars. Several major construction projects during the 1990s transformed the campus, as expanded curriculum called for new education spaces. Groundbreaking for the fire science building took place in 1991; the Small Business Development Center, which is part of the current Shah Center, opened in 1992; the Center for Advanced Technology launched in 1996. Groundbreaking for the Student Services building happened in 2001. 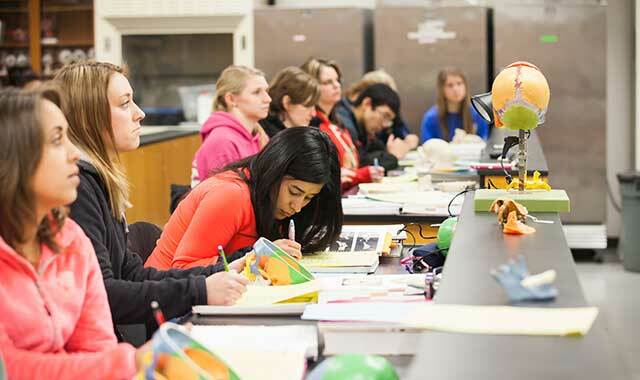 MCC has seen a steady enrollment increase through the years. The college opened its doors in September 1968 with 312 full-time and 1,045 part-time students. The college’s highest enrollment numbers came in 2010, when 7,392 students were enrolled on campus – a reflection of a national trend toward rising community college enrollment. The MCC Promise program further boosted enrollment, as it offered free tuition for area high school seniors who attended MCC full-time. Those students were required to volunteer in the community for at least 32 hours each year. Today, MCC provides training, adult education and college-level courses to nearly 7,000 credit and 30,000 non-credit students each year. Additional community events, seminars and special programs benefit nearly 60,000 people each year. New programs continue to pop up. The culinary arts program, launched in 2009, introduces students to careers in the professional kitchen. Students can earn a degree in either baking or culinary arts. Their degrees can transfer to four-year universities around the state, including Southern and Northern Illinois Universities and Roosevelt University in Chicago. “From SIU, you only need 30 more credits to complete a bachelor’s degree,” Drzal says. The public is invited to sample student creations on campus at Tartan Bistro, a student-run restaurant that serves both food and alcohol. Students come not only from within McHenry County but also from portions of Boone, Kane and Lake counties. The college offers many types of associate degrees covering fields like science, art, fine arts, engineering and general education. Degrees and certificates are also available through online courses, meaning students can get a degree from home without ever setting foot in a classroom. Sarah Sullivan, history department chair and faculty council chairwoman, has been at MCC for 20 years. She’s seen teaching evolve over that time, especially with the addition of technology. Every classroom at MCC is a so-called “smart” classroom, meaning it has interactive whiteboards and access to the internet. That’s a long way from when Sullivan began teaching with blackboards and overhead projectors. Since cellphones are nearly ubiquitous, Sullivan uses them to her advantage in the classroom. Technology aside, Eckel doesn’t think student life has changed all that much. Eckel also says technology has influenced his teaching. Numerous online tools support what happens in the classroom. “All of my assignments are online, students submit them online, I grade them online and the grade book is online,” he says. Eckel finds that student demographics are evolving, too. No matter how old you are, Sullivan believes MCC continues to provide essential access to knowledge and resources. “Community college is a very cost-effective way for a young adult to complete the first couple of years of their college education,” she says. Cary resident Amy Saldivar is just one of many students launching her education close to home. The second-year student aspires to major in business education. Saldivar had a big boost from the dual credits she earned at Cary-Grove High School, in Cary. When she graduated in 2016, Saldivar had nine college credit hours in hand. She plans to earn her associate degree and transfer to Illinois State University, located in Normal. Lorrie Janeczko, a 2016 MCC graduate, believes staff members are more than just teachers. They have a vested interest in students’ success. MCC helped Janeczko pay for her education with the Education to Empowerment scholarship. It paid her second-year MCC tuition and one year at a four-year school. Janeczko received her bachelor’s degree in general studies from Columbia College in Crystal Lake and is currently enrolled in a physician assistant master’s program at Midwestern University, in Downers Grove. MCC has grown consistently over the past 50 years and is quickly sowing the seeds for its next 50 years. The new Liebman Science Center, scheduled to open in fall 2018, is a big step forward. The two-story science center will be the central hub for careers in science, technology, engineering and mathematics fields. The building is expected to provide 22,000 square feet of learning space including a cadaver lab, a student resource lab, a lecture hall, a planetarium and two prep rooms. It will also support existing science and health care programs, including biology, chemistry, earth science, physics, nursing, health information technology and patient care technicians. The $16.8 million pricetag is being supported by college funds, student fees and a capital campaign. The building is scheduled to be completed next fall. When ground was broken on the new center earlier this year, MCC President Clint Gabbard praised local resident Charles Liebman and his family for their $5 million donation. Sullivan believes the college is in a good place to move forward. She’s also looking forward to seeing the college continue to grow. “I expect that we’ll have to continue to grow in technology, and we’ll continue to create new programs and tweak content in our current programs to address the needs of employers in the future,” she says. Konitzer says he’s happy to see just how far the college has come, and he has faith in where it’ll go. Students and community members alike can stop by the cafeteria between Buildings B and C to see a 50-year timeline of the college. It’ll be on display through 2017. MCC will continue its anniversary celebration with several events throughout the coming months, including its Anniversary Gala: Moonlight Masquerade on Nov. 10 at The Starline Factory in Harvard. Visit mchenry.edu/50 for more information. This entry was posted on Tuesday, September 12th, 2017 at 11:58 am	and is filed under Features, Top Posts. You can follow any responses to this entry through the RSS 2.0 feed. Both comments and pings are currently closed.